MIAMI, FL -- (MARKET WIRE) -- August 21, 2006 -- Jon NEVERDIE Jacobs, the Gamer who bought a Virtual Asteroid inside Entropia Universe in late 2005, reports the Club NEVERDIE, his virtual Resort, grossed $100,000 USD in the first eight months of operation. The Resort opened on December 19th, 2005. "It's a tremendous vindication to reach the break-even mark so fast; very few people really believed a turnkey virtual business inside an MMORPG could do these kind of numbers, but the dynamic real cash economy in Entropia Universe is extremely conducive for operating a business or developing a trade; however, once you have the tools or skills it's really up to the individual to serve the community and develop the business. It's definitely work, but since it exists within a Video Game style world, I'm in my element," says NEVERDIE. "But, not everyone is going to get rich. In many respects, Virtual Reality is like the wild west, you have to be bold and not a quitter; many of the laws that will eventually govern Virtual Reality are not in place yet; it's fiercely competitive, there is always intense debate in the forums, of course not everyone is going to make money; you need vision and you have to place your faith in technology. But, this is definitely the decade of the gamer!" The $100,000 Gross Revenue to the Asteroid is broken down into $82,270 from the 5.5% hunting and mining taxes levied on virtual colonists who use the Asteroids bio domes to gather natural resources, $11,340 from sales of Virtual Apartments which the players use for storage and socializing and $6,340 from the sales of Shops in the Virtual Shopping Mall. NEVERDIE says, "Club NEVERDIE is the #1 destination for live entertainment in Entropia Universe, and if the numbers are anything to go by, it is probably the most successful player-owned and -operated turnkey business in any Virtual world!" Jon NEVERDIE Jacobs has been one of the most high-profile Entropia Universe citizens for over three years. 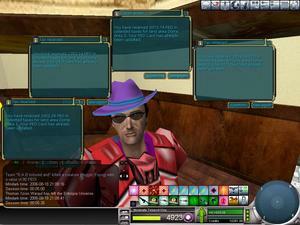 His virtual Net worth is estimated to be over one million dollars; he was originally known for acquiring some of the most sought after and valuable virtual treasures; he then became something of a virtual pop star when he recorded a hit song "Gamer Chick," which was featured on Juke Boxes throughout Entropia Universe; the accompanying machimima music video has topped the RPG charts at ifilm.com for over two years. NEVERDIE made headlines around the world in 2005 when he purchased an asteroid space resort for $100,000 USD, since which time his avatar has been featured on worldwide magazine covers and in documentaries for Discovery Channel and Canal+. In August 2006, he won the first Champions League title and he plans to host the Massive Multiplayer Online World championships at his resort in December. Club NEVERDIE is situated within the Entropia Universe. NEVERDIE is a registered trademark of Jon Jacobs. Club NEVERDIE was established on December 19th, 2005, and can be visited via spaceship from the planet calypso or new accounts can be spawned directly at the resort by downloading the Entropia Universe client from www.RealityPort.com and also www.NEVERDIE.com.